While the terms pendants and necklaces are sometimes used interchangeably and are definitely related, there are some key differences. A pendant is an accessory or piece of jewelry that typically hangs from a chain. Pendants can be sold separately from their chain, but most pendant necklaces for men come with a chain included. On the other hand, the much more general term ‘necklaces’ can include pendants but is not limited to them. What materials do men’s necklaces come in? 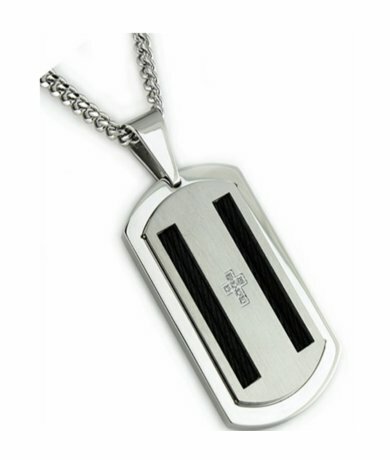 Necklaces for men are available these days in nearly any kind of material that you can imagine. Most contemporary and fashion men’s necklaces are made in more budget-friendly materials like titanium, tungsten, silver, stainless steel and leather. For more costly and luxurious necklaces for men, look for precious metals like gold, platinum and palladium. What type of chain should I choose? In the case of pendant necklaces, the chain is usually chosen for you, though rest assured most designers do so carefully to match to the style and look of the pendant. If you are opting for a necklace that is solely a chain, the link style can become rather important. Different link styles can present vastly different visual effects. 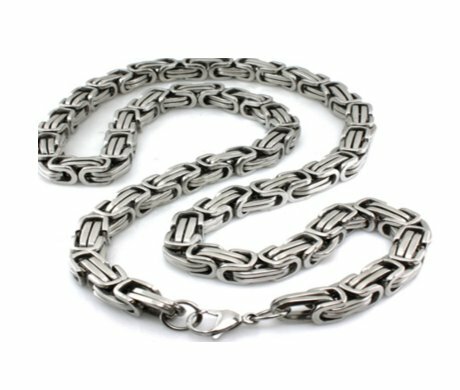 Some of the most popular types of chain necklaces for men include Figaro, box, rope, snake, bead, figure-8 and curb chain. Of course, other key elements like material, clasp and chain width and length play their own roles with the overall appearance of chain necklaces. What length should I get my men’s necklace in? The length that you choose will largely depend on two factors: the size of your neck and where you prefer the necklace to hit. An 18” necklace will hit around the base of the neck for smaller sized necks, while a 20” inch necklace is the preferred standard length for most average sized men and will hit around the collarbone. 22” and 24” are the next two sizes up, and will hit most average sized necks just below the collarbone and just above the sternum, respectively. If you don’t know if your neck is smaller, average or larger sized, just refer to your shirt collar size, or take a measurement of your neck using a soft tape measure. Should I only wear one men’s necklace at a time? The layered look is actually very in style for men’s necklaces right now, but proceed with caution – more than two necklaces at a time is largely for the fashionably adventurous! Make sure to choose thinner necklaces of different lengths, and avoid overly bulky chains.